Between 16 and 23 August 2016 the People’s Protection Unit (Yekîneyên Parastina Gel‎; YPG) and Syrian government security forces (National Defence Force and Syrian Armed Forces) fought for control of the city of Al-Hasakah in North-east Syria. It ended with a ceasefire, mediated by Russia, and resulted in the Kurdish forces taking control of the vast majority of the city. During YPG operations, the prison was liberated. 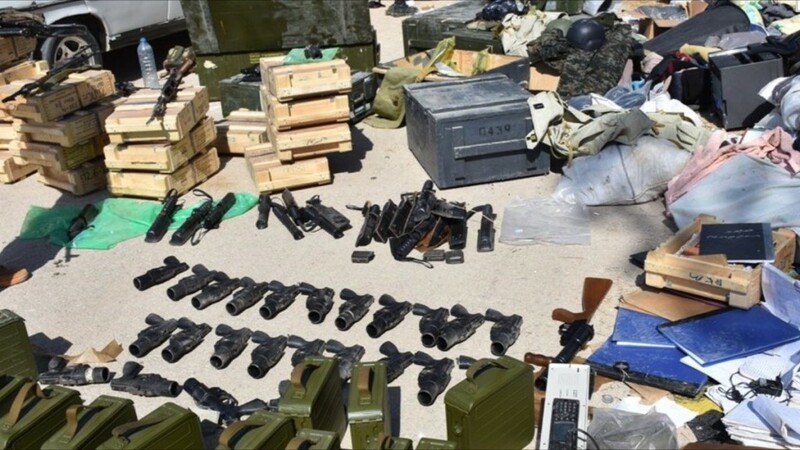 Subsequently, video and several images emerged on social media showing weapons and ammunition which had been seized by the YPG after clashes with Syrian regime forces. In the screen capture above, two dozen black pistols can be seen towards the centre of the image. These are most likely to be Iranian 38 mm Hoshdar 2 series signal pistols. Whilst described as signal pistols by the manufacturer, these are multipurpose pistols, capable of firing 38 mm signal cartridges, illumination rounds, smoke cartridges, and riot control munitions such as rubber buckshot, rubber baton, and riot control agents (CS, CN, etc.). The design of the Hoshdar 2 series is simple: they are smoothbore, single shot, break-open weapons with a locking latch over the barrel. The construction is primarily of high-tensile aluminium alloy, giving it lightweight durability and improved muzzle velocity, with an effective range of over 75 m.
The pistol is known as the Hoshdar KP, whilst a modified version that adds a buttstock, adjustable foregrip, and an extended barrel is known as the Hoshdar TP. The TP configuration increases the weapon’s weight from 0.952 kg to 2.796 kg, and increases its length from 265 mm to 828 mm. This larger weapon would be more commonly used in riot control operations, being easier to handle and firing less-lethal rounds with greater accuracy. Additionally, it has been mounted on top of vehicles when deployed in a public order role. The long-barrelled weapon to the right of the pistols in the image above is not a Hoshdar TP, however. 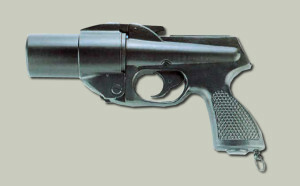 The Hoshdar 2 series weapons are Iranian copies of the British Webley & Scott Schermuly Multi-Purpose Gun, commonly used in Northern Ireland in the 1980s. The only 38 mm cartridge featured in recent Iranian arms export brochures is the Mk. 2 CS, which is outwardly identical to the British round of the same name. The Hoshdar series are currently in production by the Ammunition Industries Group (AMIG) of the Defense Industrial Organization (DIO), an Iranian state-owned weapons manufacturer, are offered for export sale, and are presently used by the Iranian armed forces. When considering the geographical proximity, military trade ties, and overt support that Iran has provided to President Assad during the ongoing conflict in Syria, it is not surprising to see these items in service with Syrian regime forces. Whilst these types of weapons are generally somewhat uncommon in a conflict zone, the seizure of these items from a prison, alongside numerous batons and other items, aptly explains their presence in the Syrian conflict.